In answer to the ascendancy which the SE5s and SPADS of the Allies were gaining, the mid-summer of 1917 saw the introduction of the D-V from the Albatross stable. The D-V did not prove to have sufficent increase in performance to restore the balance of power in favor of the German Air Corps. Nevertheless, orders were put in hand for vast quantities, presumably on the theory that sufficient numbers would overwhelm any opposition. 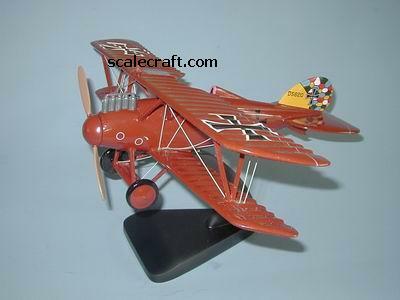 A unique fact remains about the ubiquitous Albatross D-V. That was that many German Aces scored many if not most of their victories in the type, including the famous Red Baron. Mahogany Wood. Wingspan 17 3/4 inches, Length 14 1/2 inches.